I arrived back in New Jersey yesterday afternoon. Standing at the baggage carousel in Newark, I overheard a group of people chatting about Morsi’s resignation, which was news to me. The last I’d heard was Morsi declaring he would resign over his “dead body,” in what was apparently a disappointing speech delivered while I was en route to the airport. In addition, my new US Embassy friends told me that they’d been evacuated, and had just been updated by their boss that all embassy employees were being evacuated from Cairo. Over the last few weeks, folks from home have expressed both worry and concern about my life in Cairo and about what these events mean for Egypt’s future. To the western world, whose only connection to Egypt is the camera lens of the media, it appears that the entire country has descended into uncontrolled chaos and violence, but in fact, the violence has been minimal. Let me try to shed some light on what caused this to happen. Morsi’s first year as president was largely disappointing to many. When he was voted in last June 30th, I remember seeing my colleagues in tears but still expressing some hope that it might not be as bad as they anticipated. What struck me was the initial response from the media, and the amount of articles questioning Morsi’s plans for Egypt, many of which highlighted the question of whether bikinis would be banned at Red Sea resorts. Others feared that he would implement Sharia Law. But the larger concerns, like the myriad fatalities on Egypt’s poorly maintained and monitored roads, Egypt’s floundering economy, and Egypt’s role in the global community all seemed to be of lesser concern. At the beginning of his term, the people waited to see what accomplishments he might make. It is true that one year in office is far from a sufficient amount of time to undo the damage created by the years of dictatorship that preceded democracy. But it soon became clear that his goals and ambitions did not seem to align with those of the Egyptian people. For example, Morsi made international headlines back in the fall when he negotiated peace between Hamas and Israel regarding trouble over the Gaza Strip. He earned himself a spot on the cover of Time Magazine, who hailed him as “the most important man in the Middle East.” Even we were pretty impressed with his diplomacy – until a few days later, when he basically passed a law giving him full governing authority and prohibiting his cabinet and parliament from objecting to any decrees he passed. Suddenly, ‘president’ didn’t seem as appropriate as ‘pharaoh’ or ‘dictator,’ which the Egyptian people quickly perceived and spoke out against, as you do in a democracy. Fortunately, he rescinded the decree in December, but the people were wary. Since then, I’m not sure what steps Egypt has made toward improvement. Sexual harassment has worsened significantly, with regard to Egyptian women and foreigners alike. Previously kept in check by Mubarak’s secret police, sexual harassment in Egypt has become what the New York Times has labeled an “epidemic.” This is not to suggest that it can only be combated by a secret police force, but increased police presence on the streets or government initiatives protecting women might be steps in the right direction. If I were to be groped on the street, I wouldn’t know who to contact. I probably wouldn’t report it, because I wouldn’t know who to report it to. This is in stark contrast with a story that Jamie told me about a female friend of his who was walking back to her apartment late at night a few years ago, before the revolution. She noticed a man start to follow her, when a police officer stepped out onto the street behind the man. The man quickly disappeared, and the police officer kept an eye on her as she walked the rest of the way. To many Egyptians who I’ve spoken to, nothing has gotten better. Traffic on the Ring Road has only gotten worse, with overturned semis obstructing entire lanes and slowing traffic to a standstill for hours before they are finally cleared off. Fatal automobile accidents are frequent, and police presence is close to nil. I have friends who have seen people get hit by cars, and colleagues who have lost more than one friend in a car accident. This all came to a peak in November, when a bus carrying Egyptian schoolchildren on a trip was hit by a train while crossing the tracks. 50 were killed, most of them young children, all because the man operating the manual gate had fallen asleep and forgotten to lower the gate to signal the train’s approach. Morsi’s response was to punish those responsible and, according to colleagues and Egyptian friends, promise money to the families of the deceased children. (Apparently the amount to be paid was also offensively low.) In addition, he garnered much criticism for not responding sooner; later, Egyptians compared his response time to the time it took for Obama to deliver a speech after the Sandy Hook shooting. Then there’s the economy, which was struggling after the revolution but has recently plunged into what seems like an inescapable downward spiral. Back in August, the US dollar was worth 6 Egyptian Pounds. Now it’s up to 7, which is better than a few months ago when it was nearly 8. 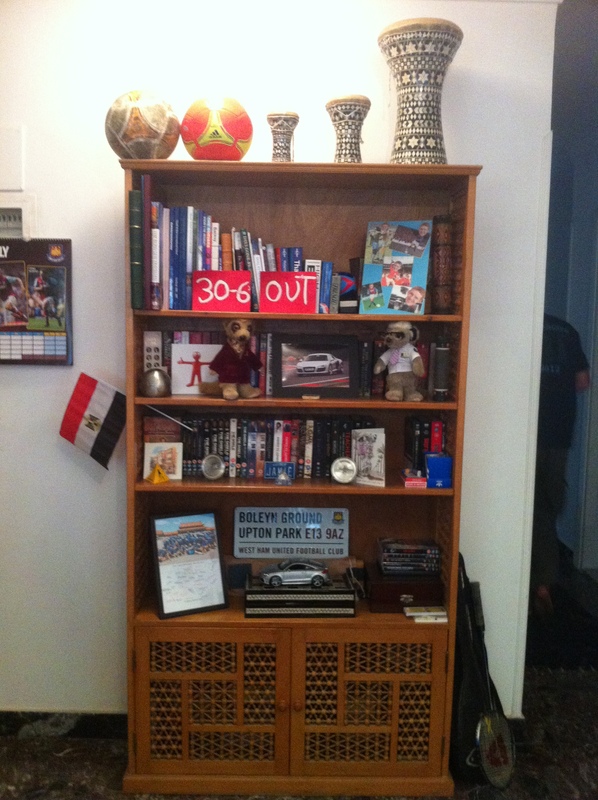 For Americans living in Egypt, though, this isn’t much of a concern, as dollars have become nearly impossible to find. They are so scarce, in fact, that in order to withdraw USD from my bank account, I had to show proof of upcoming travel to the US and was limited to a $1,000 withdrawal. Egypt’s economy thrives on tourism, something else that’s been on the decline lately. The New York Times recently published an article focusing on the town of Luxor, where majestic temples and towering, Ozymandias-caliber statues have stood in isolation for much of the year. Disappointing, yes, but moreso for the citizens of Luxor, many of who depend solely on tourism for their income. How does Morsi remedy this? A few months ago, he appointed as governor of Luxor a man affiliated with Gamaa Islamiya, a group responsible for killing 58 foreign tourists and 4 Egyptians in Luxor back in 1997. After the people expressed outrage, Adel El-Kayat, appointed governor, resigned ‘for the good of Egypt,’ as he said. There are no words to express the level of disbelief here. I imagine it would be similar to this: a man blows up part of the Atlantic City boardwalk in New Jersey, killing 50 people in 1997. Now, in 2013, Obama appoints him governor of New Jersey. Imagine the public reaction. Westerners have been quick to judge Egyptians for ousting their president. “But Egypt chose democracy. Wait three more years, then vote for someone else.” This is a very fair statement, and one that has blurred the lines for me about what democracy actually means. I, along with many others, immediately create parallels between Egypt and the United States. Mass protests in Washington, DC wouldn’t result in Obama’s resignation. At the same time, the problems we face as a people in the United States are far different from the problems faced in Egypt. Three more years of similar behavior on Morsi’s part would drive Egypt even further into the ground. This is a country that, just two years ago, freed itself from years of oppression and dictatorship just to become entangled in similar crippling, regressive politics. For example, Mubarak’s regime is infamously synonymous with the Emergency laws and mass, dubious arrests of people for opposing the regime. Fast forward to March 2013, when a warrant for arrest was issued to satirist Bassem Youssef, Egypt’s Jon Stewart, for insulting the president and insulting Islam. Which, if you have a democracy, shouldn’t be punishable, right? As Jon Stewart poignantly put it during his recent appearance on Bassem Youssef a few weeks ago, “If your regime can’t handle a joke, you don’t have a regime.” Bassem Youssef’s situation gained attention because of his role as a TV host; it would be like, again, Obama arresting Jon Stewart for insulting him. I wonder how many others have been questioned or arrested during Morsi’s term? None of this smacks of democracy, but it is democracy nonetheless, right? I was chatting earlier with my cousin Kyle about this. “But they voted him in, didn’t they?” This is a good question. Nearly every article I have read on BBC since the June 30th protests began ends with some sort of summary stating that Morsi was elected last June in ‘what is considered a free and fair election.’ Of course, talk to Egyptians and they’ll tell you it was fixed. Either way, the votes were extremely close: Wikipedia cites it as 51.7 to 48.3. Who voted for Morsi, then? Popular opinion is that it was mostly people living outside of the city, the uneducated portion of Egypt’s population doing what they’re advised to. Which makes sense, if you think about the people who are protesting in Tahrir right now (many of whom are educated) and the contrastingly small number of supporters for the Brotherhood. This entry has, so far, been political, and political in a very biased, foreign perspective. I say this because I have no idea what it’s like to live in Egypt as an Egyptian under Morsi’s rule. I can’t begin to fathom it. My life in Egypt is practically decadent, with the occasional annoyance of a two hour power outage or the infuriating hiss from a man on the street. I am biased in a sense that I get the news from my friends and colleagues, and some of it resonates with international media like BBC or The New York Times. But the level of disappointment and discouragement I see every day with Egyptians I meet from all walks of life is heartbreaking. Here are people who chose democracy in hopes that their country would improve, but have found that after one year, it has only gotten significantly worse. Which brings me to a question I’m often posed by friends and family members: why on earth would someone want to live in Egypt, and how safe can you possibly feel? This is a fair question, especially when you read about things like the governor of Luxor or the constant impending danger that apparently lurks around every street corner in Cairo. A day or two before the June 30th protests, I found myself in a cab with a driver who spoke excellent English. Like many Egyptians in that past week, he was energetic and excited about the upcoming protest. He told me how anxious Egyptians were to get Morsi out of office, and went on to explain that he, like many Egyptians, felt the negative impact of Morsi’s term. He went on to ask me where I was from, and I replied honestly (I sometimes don’t; I am sometimes an unemployed Canadian woman with a husband and two children). It was a refreshing conversation. This is not to say that this man’s views are shared by all Egyptians, but the amicability I encounter most of the time from Egyptians reflects what he was saying. Shop owners are eager to talk to me, and in the recent weeks, they’ve been equally eager to share their dissatisfaction with Morsi and their enthusiasm for the Tamarod, or rebel, movement. And aside from the random men in the street who ogle at me, I’ve found that Egyptians are friendly and helpful. In the days before the revolution, I felt a little nervous walking around because I didn’t know what to expect. Large groups of people can quickly turn into mobs, and I’d read about the American who was stabbed in Alexandria while videotaping a protest. In addition, I learned from a friend that the US Embassy was not only warning US citizens to avoid demonstrations (as it always does), but also encouraging people to stock up on food and water, enough to last two weeks. I wasn’t so much afraid of being engaged in some violent altercation as I was of the uncertainty. I moved in with a friend, stocked up on non-perishables and water, and resolved to lay low. In the days leading up to the 30th, large crowds of people gathered in a spacious roundabout near the pub, and I found myself walking through or around them to get home. One day, my friend Danny, who is half-Egyptian, led me to the protest and took my iPhone to record. At first, I stood on the outskirts feeling nervous. But the more I watched, the more I realized that the atmosphere was one of festivity and hope, not anger and violence. We went out again the next night, and were immediately handed flags and red rectangles of construction paper reading “30 6” and “Out”. Among the protesters, I found a student and her mother, twenty-somethings videoing the crowd with sleek new iPads, older men talking excitedly with one another, women with veils, small children on shoulders, and babies in strollers. 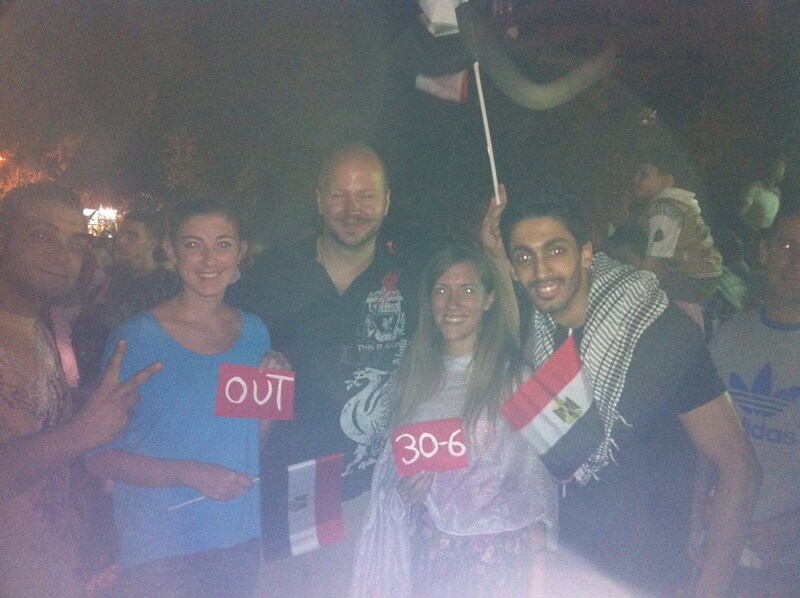 On the 30th, they gathered there and marched down to Tahrir together. Jamie and I laid low, watching TV and fervently checking the news for updates while crowds amassed in Tahrir in unprecedented amounts that surpassed the number present during the 2011 revolution. 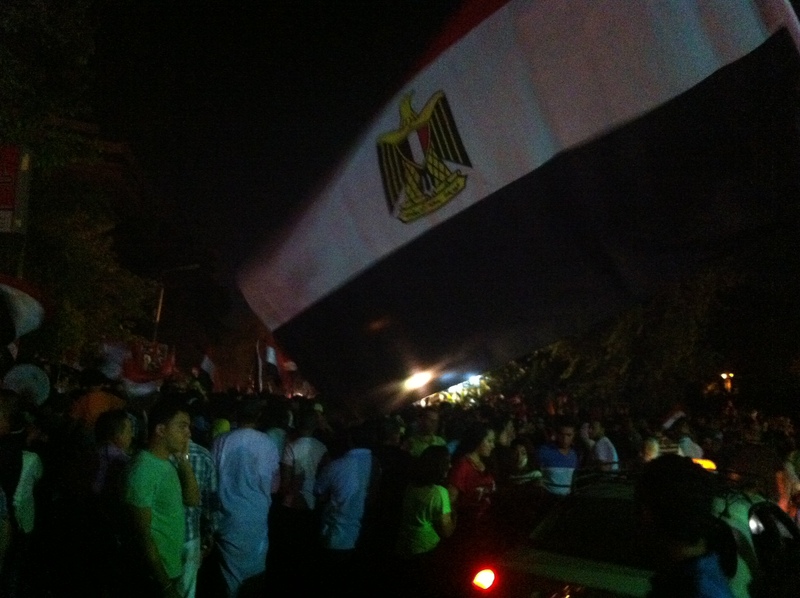 News outlets reported that people were optimistic and celebrating, a report confirmed by some Egyptian friends of mine who were there. What followed has been surprising and, as of now, hopeful. The military posed a 48-hour ultimatum to Morsi: resign, or be deposed. 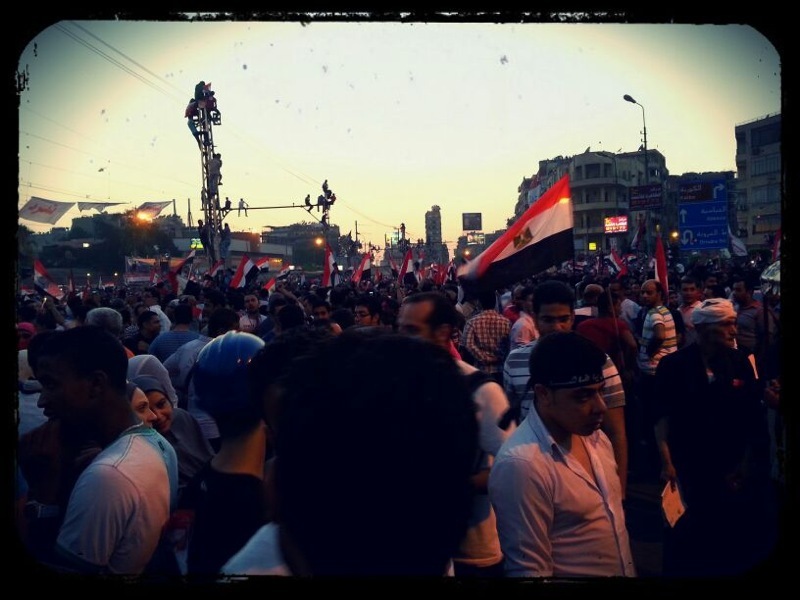 The more obstinate Morsi was, the more the atmosphere in Tahrir deteriorated. But the violence that came with the January 25 revolution was, for the most part, absent here. Friends back home expressed worry about my trip to the airport; I arrived without incident. People expressed fear at being able to get out of the country, or what might happen if the military took control. Would there be a coup? Would the country fall under control of the military as it did in the year or so after the revolution? What would the army actually do if Morsi didn’t honor the ultimatum? 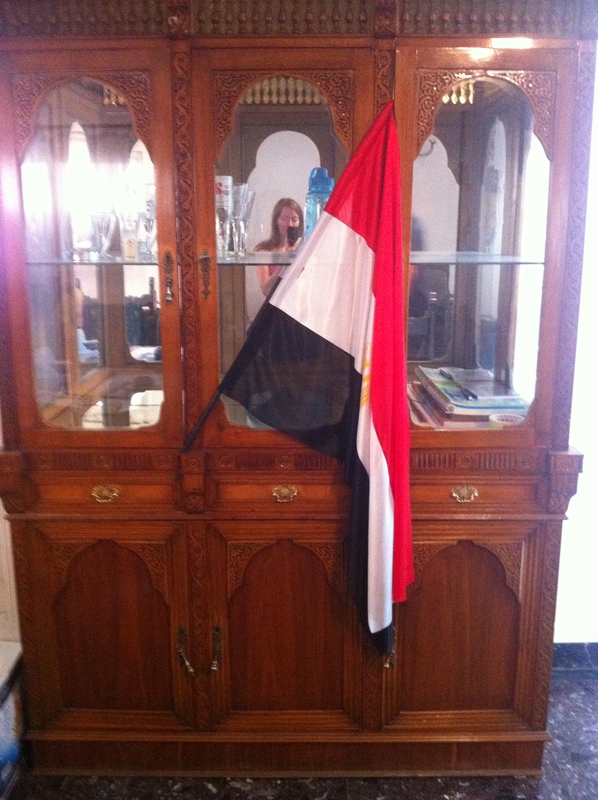 48 hours passed and Morsi, as promised, was swiftly kicked out. The military stepped in, swore in interim leader Adly Mansour, and supposedly stepped back out. We’ll have to wait and see how it all unfolds, but crowds have been portrayed as euphoric on the news. The US Embassy has evacuated its non-emergency personnel, many of whom seem disappointed, like the ones I met in the airport. Some friends of mine have also been evacuated to Jordan for a week. 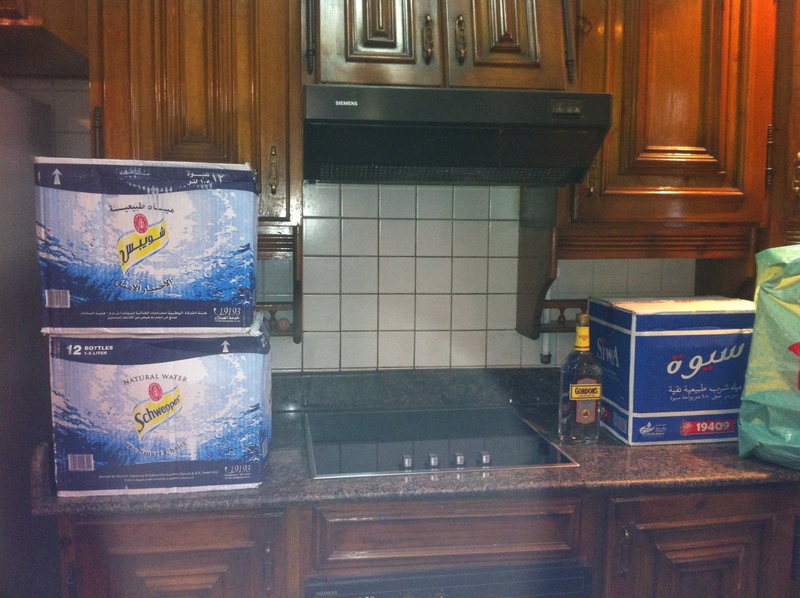 But my friends who remain in Egypt seem to feel very safe in the jubilant aftermath. I don’t mean to make Egypt out to be the safest place to travel, but as someone who calls Egypt home for 10 months out of the year, I can say that I felt safe there up until the day I left. I also don’t mean to shower this second revolution with excessive praise, but I am impressed at how quickly and efficiently the military acted and how peacefully and civilly the opposition behaved. It isn’t over, and there is always the chance of violence, but as of right now, I remain proud of and hopeful for my Egyptian friends.